Organic ales, lagers and pilsners are increasingly squeezing their way into retail coolers alongside non-organic beers. When Jon Cadoux launched his line of ales under the Peak Organic label this spring, he figured making them organic would distinguish them from the multitude of other beers on the market. At the same time, he wanted to put out a product he says is healthier for people and the planet. Organic beer has even drawn the attention of the nation's largest beer company, Anheuser-Busch, which is now producing two organic beers of its own. Those beers, Wild Hop lager and Stone Mill pale ale, are being sold in several test markets nationwide. Cadoux, a Burlington, Mass., resident who founded Peak Organic Brewing Co., says people are embracing organic foods as they become more educated about what they put into their bodies. He views his organic beer, which is brewed in Portland, as a step back to the past. "Organic is not a new movement," said Cadoux. "Our grandparents grew up eating organic foods, although it wasn't called that." Organic beer sales increased 40 percent in 2005, tying it with organic coffee as the fastest-growing organic beverage, the Organic Trade Association says. By comparison, overall U.S. beer sales fell slightly last year. Butte Creek Brewing Co. in Chico, Calif., sells its organic beers in about 25 states, up from half a dozen states five years ago, said Scott Burchell, national sales manager. Not long ago, organics were niche products that were often associated with vegetables, milk and bread, Burchell said. But organic products of all types, including beer, are now widely available at organic and natural food retailers like Whole Foods Market and Wild Oats, and in mainstream supermarkets with organic and natural food sections. At the Wild Oats in Portland, for instance, customers can buy six- and 12-packs of assorted Peak, Wolaver's and Butte Creek organic beers. "The interest level in the past year has grown so that we don't have to pound on doors to sell our product," Burchell said. "Now we're getting phone calls from out-of-state buyers wanting our product." Anheuser-Busch launched its organic beers in March and April in several test markets nationwide. You won't find the Budweiser name on the bottles; instead, you'll find the Green Valley Brewing Co. name on the Wild Hop packaging, and the Crooked Creek Brewing Co. on the Stone Mill products. Wild Hop is brewed at the Anheuser-Busch brewery in Fairfield, Calif., and Stone Mill is produced at the Red Hook brewery in Portsmouth, N.H.
Ronnie Cummins, national director of the Organic Consumers Association in Minnesota, first saw Anheuser-Busch's organic beers at an organic products trade show in Chicago in May. Anheuser-Busch's stab into the organic market will introduce a broader audience to organic products, Cummins said. At the same time, there are concerns any time a large corporation enters the market that it could exert pressure to lower the standards for organic products and industrialize production, he said. Organic beer is made the same way as any beer, but under USDA standards at least 95 percent of its ingredients, usually barley and hops — are grown without the use of chemicals and pesticides. But Anheuser-Busch's decision to launch organic beers "sends a clear message that there's marketability," said Cathy Strange of Whole Foods Markets. "They're a smart company and if they didn't feel that there was a backbone to it, they wouldn't market it," Strange said. With or without Anheuser-Busch, the demand for organic beer is likely to continue to grow, said Morgan Wolaver, CEO of Otter Creek Brewing in Middlebury, Vt., the maker of Wolaver's Organic Ale. Gone are the days when people considered organic food an overpriced fad for granola-eating crunchies, he said. Nowadays, even McDonald's serves organic coffee. 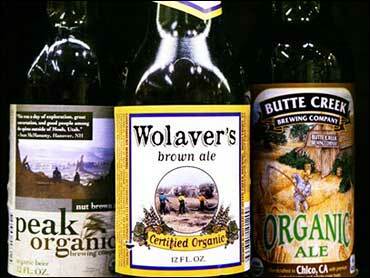 Organic beer, meanwhile, costs about the same as other specialty or import beers. "The market will continue to grow," Wolaver said. "The generation coming out of college up to age 35 is especially concerned with what's around them. They realize that they have power with how we spend our money." For Cadoux, his business combines his love of beer making with his interest in the environment. But he realizes that people won't buy a product simply because it's organic; it has to taste good, too. "Our biggest goal is to try to let people know that organic products in general, and more specifically organic beer, are delicious."